Common places where your house may be losing heat—such as the walls, roof, and attic floor—are good targets for insulation. Keeping warm in an old house can be tricky business. Houses built before 1940 were rarely insulated, and if they were the products originally used may have settled or deteriorated over time, allowing heat to escape and the cold air to creep in. 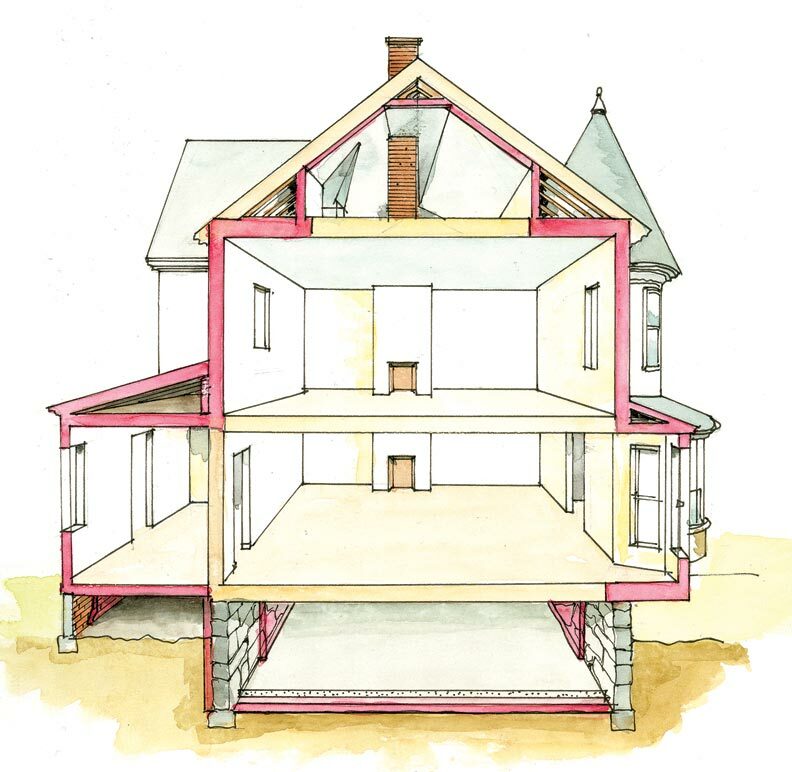 I grew up in an 1880 Queen Anne in Newton, Massachusetts—a balloon-framed house with very little insulation. I remember those icy January days well. When I complained that the house was too cold, my father would simply reply, "Put a sweater on." There&apos;s better advice available than my father dished out. Today there are loads of energy-saving, cost-effective thermal insulating options on the market, and choosing what is appropriate for your house depends on several factors. 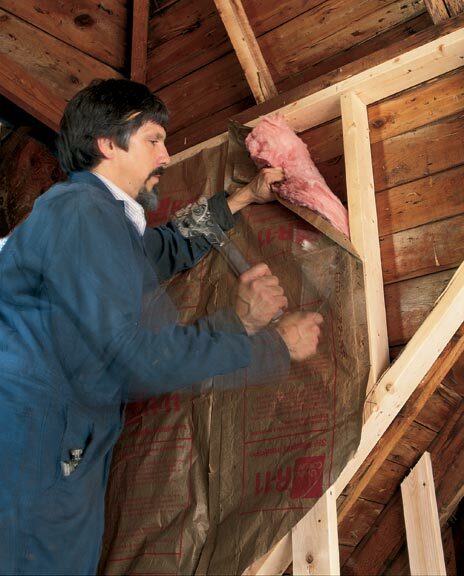 Here are some tips to guide you through your old-house insulation project. 1. How do you decide whether you need insulation? First determine if you have insulation. It&apos;s easy to confirm whether or not you have attic insulation—usually loose fill between ceiling joists or exposed batts of colored fiberglass. You can also check your exterior walls for a series of patched holes. This is a tell-tale sign of blown-in insulation. 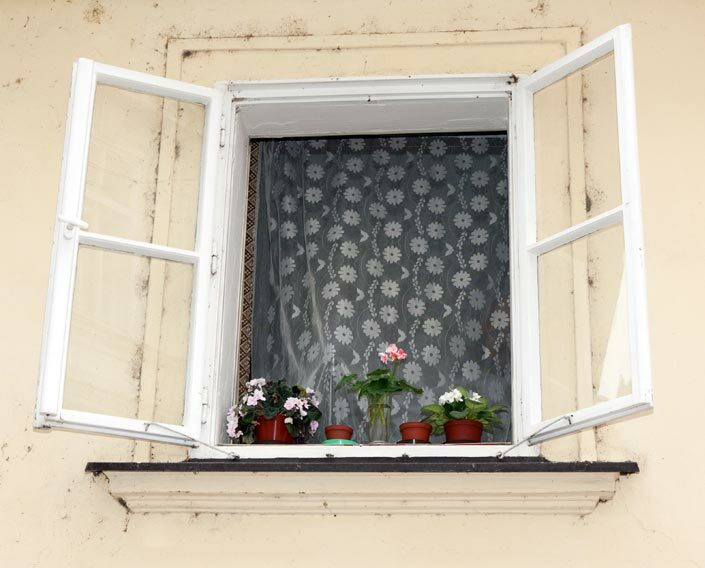 Old houses can be drafty places, and warm air can leak from a multitude of areas. Check and see where you may be losing heat in your house. Chimneys and fireplaces without working dampers are typical. Other areas to consider are air leaks though cracks around windows, ducts, electrical outlets, and recessed lighting. Note that the primary site of heat loss is through the top of the house. Heat rises and can escape though roofs that are not adequately insulated. 2. What do you do with existing insulation? Cotton batting treated with borates is a good choice for an old-house retrofit. The National Park Service advises using insulation treated with borates in historic structures because it won&apos;t corrode piping. A friend reopened sealed pocket doors on the top floor of his 1900 triple-decker in Boston recently and from inside the walls—along with the pocket doors—came shredded paper. In the late 1800s primitive insulation could be comprised of a number of mundane materials, such as newspaper, wood shavings, corncobs, and even seaweed. Mineral wools—substances like rock slag "spun" into fibers—were also installed in houses as early as 1875 and are still in use today. These early materials can be left in place. The insulation materials introduced in the mid-20th century containing asbestos and urea-formaldehyde, create the most concern in old houses today. Asbestos was a common component of heating system insulation by 1910, and by the 1930s it was also being added to some building insulation products. If you suspect your home has insulation containing asbestos, a known carcinogen, have the material tested. Complete removal of this insulation would be too invasive to most old houses so it should be left alone—unless your project is a total rehab and you&apos;ll be removing walls and ceilings. If the asbestos is flaking, you can encapsulate the material—remember asbestos fibers are a health concern only when airborne. Urea-formaldehyde, a combination of resin, hardener, and compressed air developed as an insulation material in the 1970s, was foamed into closed wall spaces. It was largely discontinued in the 1980s due to concerns of off-gassing as the product cures, but today we have a better understanding of the product and that the amount of vapors produced is finite. After the initial curing the material will not off-gas, unless it comes in contact with water or moisture, then it can break down and begin off-gassing once again. You can have your home tested for these vapors by an environmental company in your area. When insulating unfinished attics, place the batts on the floor with the vapor retarder facing down toward the living space. 3. What form of insulation do you use? Building insulation can be classified into four general categories: loose fill (cellulose, mineral, or glass fibers); batts (fiberglass, cotton, or various wools); rigid boards (composed of plastic foams or glass fibers); expanding sprays (proprietary systems). 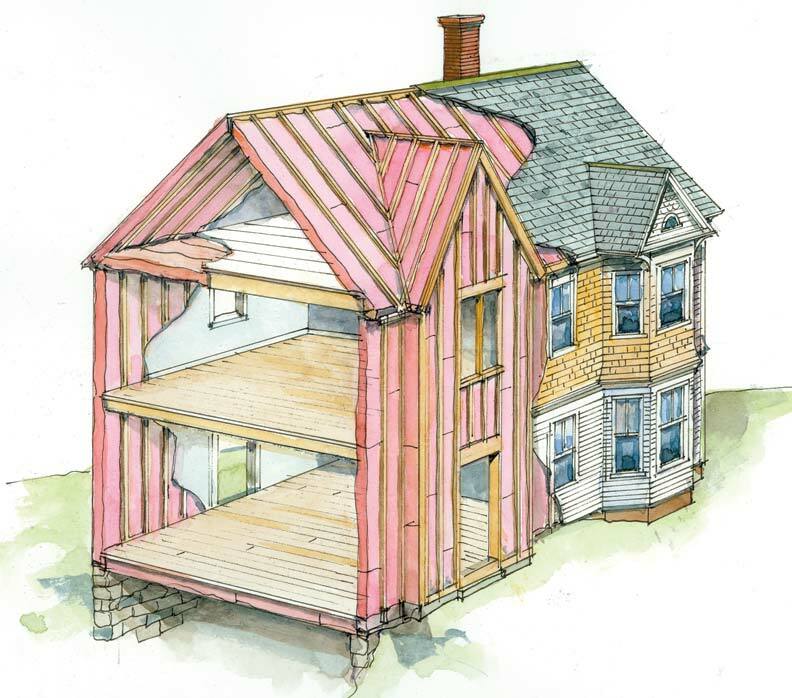 Batt and rigid insulation typically come into play during a major restoration that requires replacing walls or when you are installing insulation in unfinished spaces such as attics. The most common insulation retrofit for old houses is loose fill because it can reach places where it&apos;s difficult to install other insulation. It also has the least effect on existing finishes. The National Park Service (NPS) recommends using loose-fill cellulose (recycled newspaper) insulation that has been treated only with borates as a fire retardant, rather than insulation treated with ammonium or aluminum sulfate. "Insulation treated with sulfates reacts with moisture forming sulfuric acid, which can cause damage to most metals (including copper plumbing and wiring), stone, brick, and wood. Borates are physically and chemically compatible with many existing old-house materials," says NPS Preservation Brief #3. 4. How much insulation do you need for your house? An insulation&apos;s R-value—the material&apos;s thermal resistance or resistance to heat flow—depends on what region of the country you live in and what part of the house you are insulating. The higher the R-value the better the material insulates. R-values range from zero to 40 and more—the smaller value appropriate for warm weather places, such as Florida, the high value appropriate in chilly climates, such as Chicago. The Department of Energy has a Web site that shows what the R-value should be for your region. 5. Where do you install insulation? 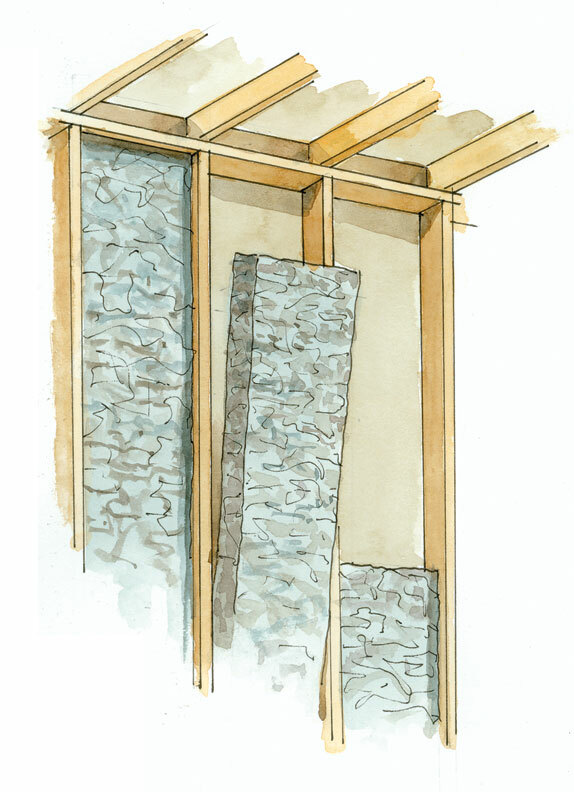 Blown-in insulation is used in existing wall spaces. Batts are used in unfinished walls, floors, and ceilings. Rigid insulation is used in masonry walls such as foundations, exterior walls under finishing, and unvented low-slope roofs. This answer will vary from old house to old house. As mentioned, most heat loss is typically through the roof. 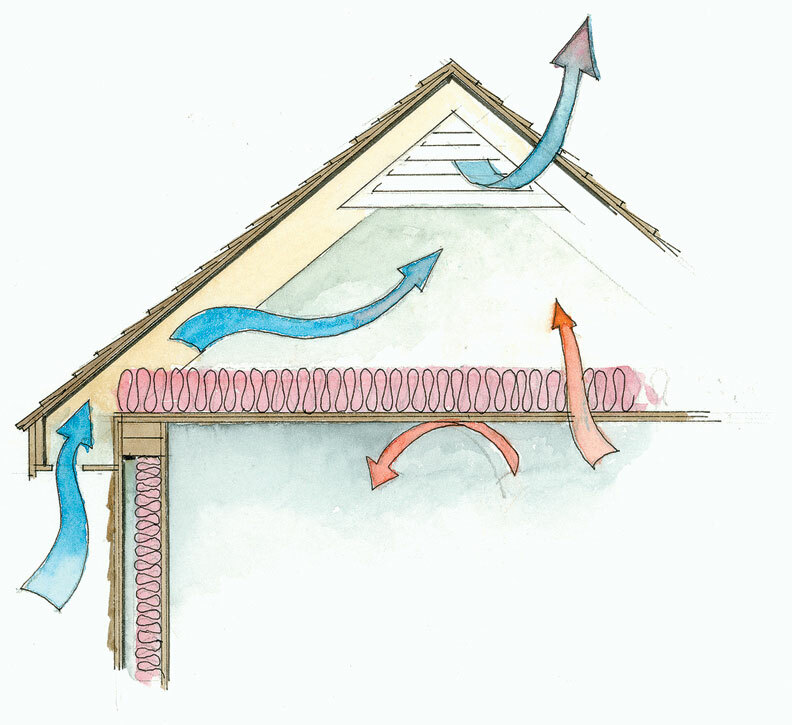 Since warm air has a tendency to rise and cool air to fall, insulating the attic is the place to start. If the attic is unfinished the insulation should be installed on the floor. If the attic is used as a living space, say a home office or play room, the insulation should be placed between the rafters. One of the biggest mistakes here is installing insulation without a proper ventilation path between the insulation and the building exterior. Don&apos;t block the soffit, ridge, or gable vents in the roof. This can create moisture problems. Thermal insulation should never be placed around old wiring. Have an electrician check to see if the electrical insulation on your wiring is up to code. The National Electrical Code recommends against blown-in or batt insulation around old knob-and-tube wiring, which could prevent heat dissipation from the electrical conductors and start a fire. 6. How do you limit moisture problems? When retrofitting an old house with insulation, one of the most important points is to avoid creating moisture problems. Mold growth, peeling paint, and even rotting wood are all signs of high moisture levels. In northern climates, moisture from living spaces (cooking, bathing, etc.) can cause problems when it migrates into walls and condenses in insulation, especially during cold weather. As the moisture collects, it can cause loose fills to settle or create other problems. To avoid this, the insulation&apos;s vapor barrier should be facing in toward the living spaces. In southern climates, moisture problems occur in the summer months when moist air from the outside migrates into the building. In these cases there is controversy over where to place the vapor barrier. Consult your insulation manufacturer for the proper placement. 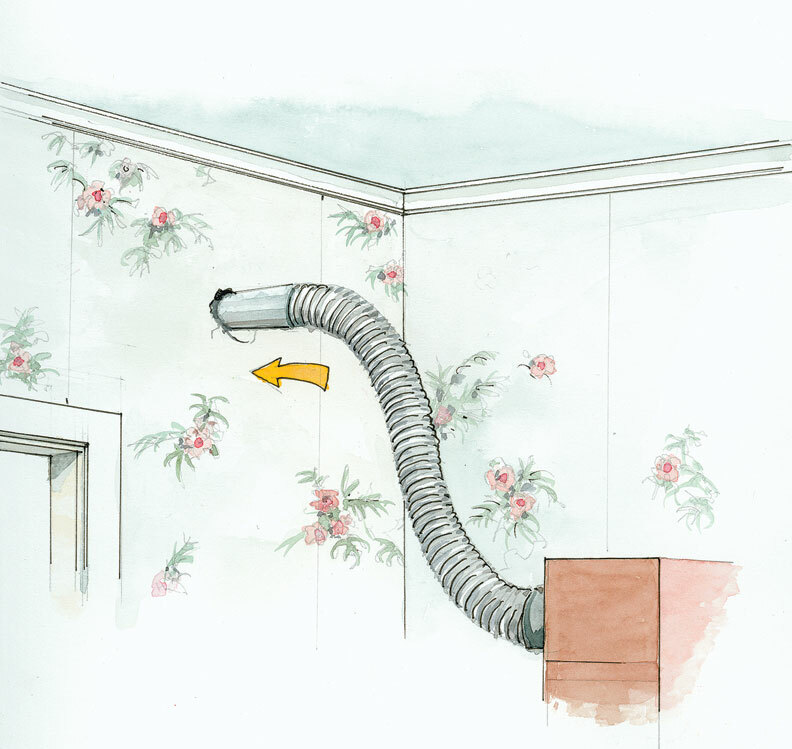 Blowing in insulation is the least invasive method of insulating your old house. You can add blown-in insulation on the inside or outside of the house. 7. Are there alternative green insulation products? There are a number of environmentally friendly insulation products on the market. Blown-in cellulose insulation made from 100 percent recycled newspaper and treated with borates for fire-resistance and protection against insects is labeled by the Environmental Protection Agency for effectiveness against termites, cockroaches, ants, earwigs, and many other insects. This product contains no free formaldehyde, no ammonium sulfate, no fiberglass, and no asbestos. Another product winning green accolades in the market place is polyisocyanurate, a rigid material that per thickness has a higher R value than batt or blown-in fiberglass, cellulose, and cotton insulation. Polyiso also provides an effective moisture barrier when used with laminated aluminum foil facers in masonry cavity wall applications. This type of insulation can be installed between furring strips when the walls in your house need to be replaced altogether. Another green insulation product is cotton insulation made from recycled denim; this product is itch-free and easy to install. It is also treated with borates to keep insects away. An early insulating material still on the market today is Homasote fiber board, which consists of 100 percent recycled newspaper mixed with a small amount of other ingredients, including paraffin wax as a water repellent and copper metaborate for resistance to fungi, termites, and carpenter ants. It&apos;s a great soundproofer, and although it has an R-value of only 1.2, South Pole explorers in the 1930s and &apos;40s lined their buildings with it. Want to save more energy in your old house? Start with these simple behavior tweaks. 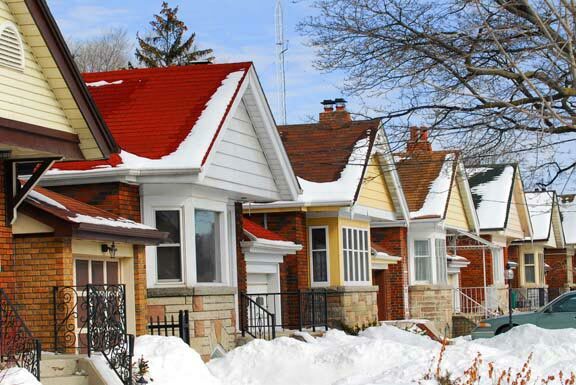 Quick tips on tightening up old houses for better cold-weather comfort.